Let’s say you have had your eye on the latest device and IT&E just came out with a great promo for it; or you just heard about the Freedom and Freedom+ plans and you want to get yourself and your family unlimited 4G LTE data; or for any reason, you just want to change your plan. The short answer is: it all depends on timing. You have 6 months or less left on a 24-month plan. You have 3 months or less left on a 12-month plan. The remaining months of your contract will be added to your new contract term. So, let’s say you were on a $40 plan for 12 months and you have 2 months left. You upgrade to the Freedom plan for $88 month for another 12 month term. Your monthly payment will now be $88 for 14 months (2 months remaining on old contract + 12 months on new contract). Don’t fall into the above categories? You can still change your plan. If you have a remaining balance, like if you were a bit behind on your payment, you will have to clear to change your plan. If you had not paid a deposit when you first signed up, you may have to make a deposit based on the result of a soft credit check (this does not affect your credit score.) The deposit is no more than $150, and if you have good credit, you may not have to pay one at all. 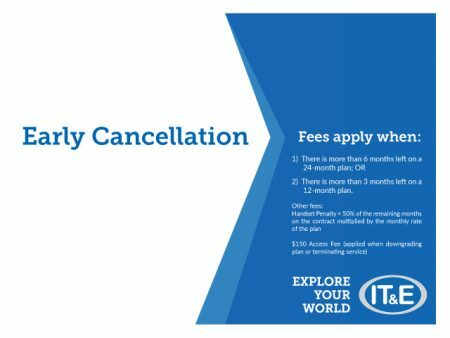 To change your plan with IT&E before the allowed time frames, the Early Cancellation Access Fee of $150 and the Early Cancellation Handset Penalty apply. The Early Cancellation Handset Penalty equals 50% of what is owed for the remaining months on the plan. Let’s say you drop your phone and the screen shatters into a million pieces. 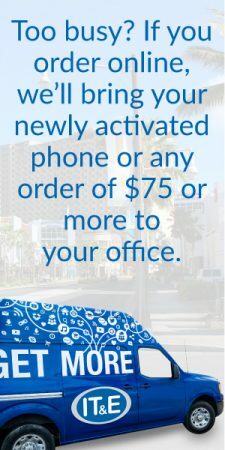 Now you need you might need a new phone. The great thing is that at IT&E, you can get the best devices on the market at subsidized or promo prices when you sing up for a new plan. 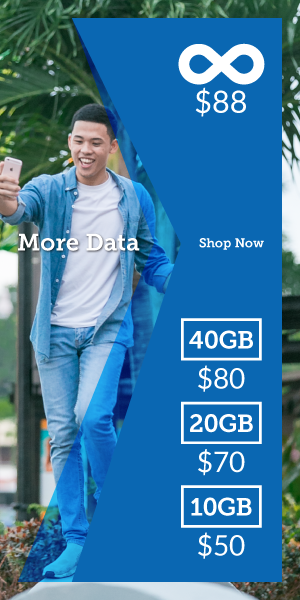 So if you want or need a new phone and you don’t fall into the categories above, you can still get a new device at the special price by signing up for a new plan. All you need to do is pay the Early Cancellation Handset Penalty. You will not have to pay the $150 Early Cancellation Access fee, unless you completely terminate your plan or downgrade your plan. Other terms and conditions of signing up for a new plan apply. Thinking about upgrading or changing your plan? Check out our online store for the hottest devices on the market!